If you haven&apos;t vaccinated your kids in New York state, don&apos;t bother bringing them to school. The news: In a recent case, a federal judge upheld a New York state policy that bans children who have not been inoculated from coming to schools where other students have a vaccine-preventable disease. The three families who were suing claimed that their right to free exercise of religion had been violated because their unvaccinated kids were kept out of class. Citing a 109-year-old ruling in which the Supreme Court upheld a fine for a Massachusetts resident who refused to be vaccinated during a smallpox outbreak, a Brooklyn Federal District Court judge declared the schools&apos; decisions sound. As it turns out, the schools were merely following along with state law, which requires vaccinations for school-aged children except in cases of religious exemptions, in which parents can file a religious objection to inoculations, or in the far less likely scenario that a doctor attests that a vaccine would harm a child. After the parents refused to inoculate on religious grounds, the schools barred the kids from coming to school, where they could presumably infect other children and break herd immunity, rendering the entire community more vulnerable to illness. Why it matters: In New York, religious exemption rates for the whooping cough vaccine, which has seen several recent flare-ups since 2012, have nearly doubled in the last decade from .23% in 2000 to .45% in 2011, as reported in the journal Pediatrics. 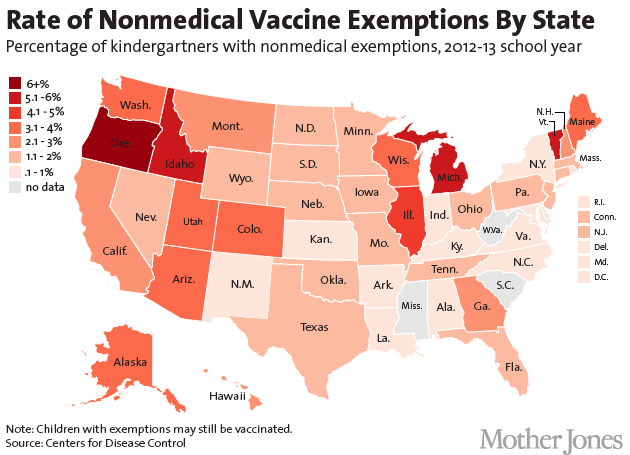 In the absence of federal vaccination laws, inoculation rates vary widely by state. While Mississippi and West Virginia don&apos;t allow children to enroll in kindergarten unless they&apos;ve been vaccinated (regardless of their parents personal beliefs), Colorado law permits parents to opt out of vaccination simply by submitting a form. Not surprisingly, rates of infection for vaccine-preventable diseases correspond accordingly. While a wide swath of the country was being vanquished by a recent measles outbreak, Mississippi and West Virginia saw no new cases of the infection. In fact, both states have stayed measles-free since the 1990s. And in 2012 and 2013, when a whooping cough (pertussis) epidemic struck the country, rates of the illness in Mississippi actually decreased. In Michigan, on the other hand, a state with one of the highest rates of unvaccinated children in the country, whooping cough numbers rose in 2012 and 2013. In 2010, whooping cough also made a violent resurgence in California. Physicians documented more than 9,000 cases of the infection — more than had been counted in any year since 1947. Public health researchers who studied the outbreak discovered that the rates of parents who had chosen not to vaccinate their children for religious or personal reasons had more than tripled in the decade prior, from 0.77% to 2.33%. There is a solution: Parents want the best for their children, and when it comes to health, they are willing to follow their doctor&apos;s lead. A recent survey published in the journal Pediatrics showed that when doctors treat vaccines as a routine aspect of a child&apos;s health care, parents usually opt to have them vaccinated. The same study also found that when doctors present vaccinations to parents as an option — like feeding their children a vegetarian diet or making them wear animal outfits — they are more likely to decide against it.